The new year will bring…. You amaze me Lissa! . . . so many projects going on!. . . ! I'm taking a break from working on 'you know what'. . . but I must pop in & say thank you for your hexagon tutorial. . .! Maybe with this technique. . . I can get my own hexagon quilt done someday! So do we get to see some of the ornaments from the exchange? Have a very Merry Christmas with your family and friends. That is amazing…thanks for the tutorial…I may have to give that a try…I could maybe get a hexagon quilt done in my lifetime. 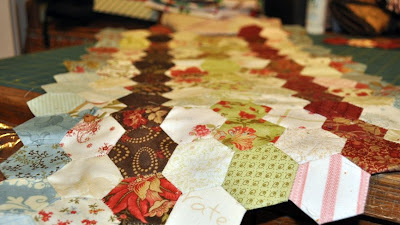 Hmm, now I am seeing a possible light at the end of my life long hand sewn flower garden quilt!. Thanks for the tutorial on hexigons. I got a bee in my bonnet awhile ago and decided I needed to make my very own Grandmothers Flower Garden quilt. 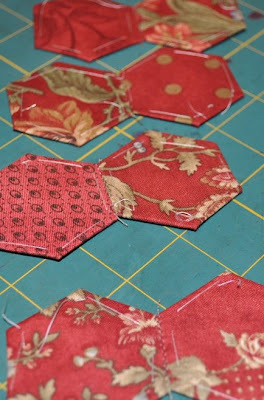 I am now at the sewing the hexigons together part so thanks for the nice little tip! Love that technique. I’ve been wondering if that’s how you’d do it. Super cool. 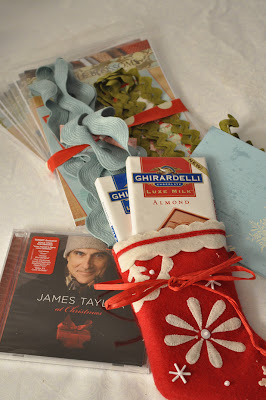 Merry Christmas right back at you! Merry Merry Christmas to you too! Hmmm what happened to “I’ll Photoshop myself in”? I have my fabrics on order, paper pieces are on the UPS truck somewhere in snow land here. I really forgot how much fun these little guys can be. Guess I don’t have an excuse now to use my invisible thread. Wow! Thanks for the hex tutorial! I’ll have to think twice about working with hexagons now! That looks pretty slick! 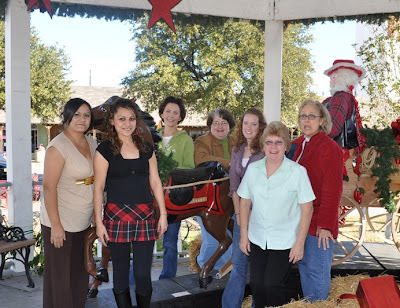 Can’t wait to see what’s in store for Christmas 2009! Either Rudolph bit Outlaw or Santa goosed her! What a funny picture of her! I am trying the hexagon thing right away. Who knew (besides Blackbird) that we could speed those things up? Thanks for the tutorial and Happy Holidays to you and yours. thanks for posting the hexagon piccies…this method definitely a great time saver. I have a little tip for you: if you baste only through the fabric you can leave the basting stitches in the top & avoid the tedious removing part ;o). I just love the name of your blog…it makes me smile! I am glad to see you use your machine for those hexagons. 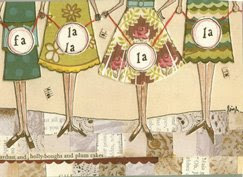 I love to applique with my machine….so many projects…so little time! Thanks for sharing the tutorial! Happy New Year! Oh wow! I have a renewed interest in my hexes again!!! I like piecing them by hand but feellike I will never finish a whole quilt anytime soon so thanks for the tutorial! I will have to get some nylon thread tomorrow at my LQS….is there a particular one you like better? Thanks again for sharing and Happy New Year! hexagons: can you use the paper again or is it too shredded? I buy my hexagons from somewhere and they are made out of a cardstock type paper. I reuse them over and over again. wondering if that would still be the case or should i just stock up on thousands of paper hexagons…………….brilliant! This is brilliant! Thank you so much for sharing! 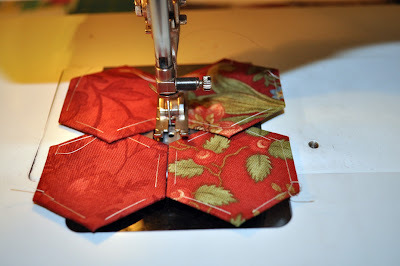 I’ve always wanted to make a hexagon quilt, but completely dislike handwork. 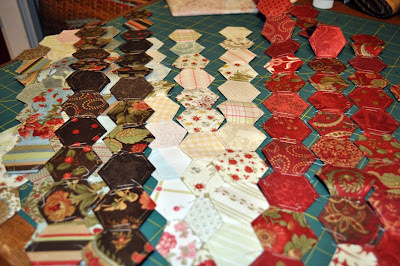 I will have to make a goal this year to make a hexagon quilt now! I can’t wait to try this! Thanks so much for showing us how! Yay!! I knew this could be done. I have hexagons all cut up from my Grandmother. I am going to make a *real* Grandmother’s quilt. Thanks ever so much for the tutorial!! I am in amazement at how quickly those hexagons go together. I have a hexagonal project that is on going. Mainly because I am sewing them by hand. Your technique shows how easy it is to assemble them.